A rainbow may be a wondrous sight but for most people it's also a fairly fleeting one. But last week, professors and students of the Chinese Culture University in Taipei's mountains were treated to one that lasted for nine hours. "It was amazing… It felt like a gift from the sky... It's so rare!" said Chou Kun-hsuan, a professor in the university's Department of Atmospheric Sciences. Prof Chou and a second professor, Liu Ching-huang, led the efforts to document the rainbow with the help of the department's students and the campus community. Their observations, pictures and video recordings showed the rainbow lasted from 06:57 until 15:55 - eight hours and 58 minutes. If confirmed, it would shatter the previous record for the longest-lasting rainbow, set in Yorkshire, England, on 14 March 1994. That rainbow was recorded as lasting six hours, from 09:00 to 15:00, according to the Guinness World Records. Rainbows typically last much less than an hour, according to the Guinness website. "After four hours, we mobilised all our students and began to notify everyone in the school to take pictures and send us pictures," Prof Chou said. "When we broke the previous record after passing six hours, I was hardly able to stay seated for lunch; it was around lunchtime. I was so excited; I wanted to make sure we captured the rainbow. But then it did something even more incredible; it went on to beat the previous record by another three hours!" The professors and department were ready to capture the rainbow because they had recorded a rainbow lasting about six hours the previous Monday, Prof Chou said. The department is now gathering all the evidence to apply for the Guinness record. "With the 10,000 pictures we took in our department alone, and the many more taken by others on campus and people living nearby, I'm confident we can prove to Guinness second by second that this rainbow lasted for nine hours," Prof Chou said. The conditions that made the rainbow last so long were a seasonal north-east monsoon that trapped moisture in the air, forming clouds; sunlight and a relatively slow wind speed of 2.5-5 metres per second. 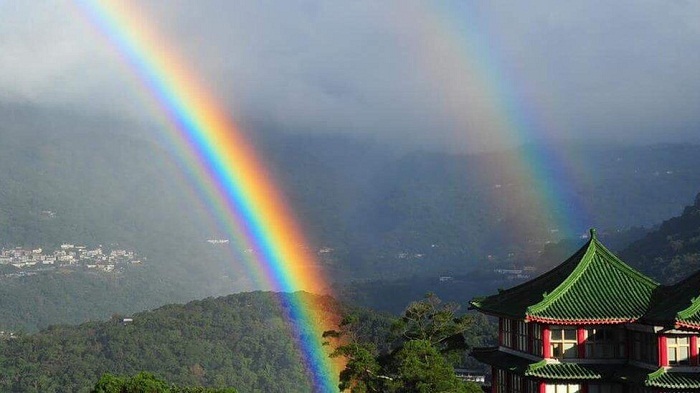 Such atmospheric conditions are common in winter in Taipei's Yangmingshan mountain range, where the campus is located, making it an ideal place for spotting long-lasting rainbows, Prof Chou said. He added: "I plan to contact the Taipei City tourism department to promote this, 'you can see a nine-hour rainbow in Taipei in the winter, it's amazing! Come to Taipei!'"